Delivery in a health facility is one of the indicators being used to measure progress in global maternal newborn health under the Sustainable Development Goals (SDGs). However, research from numerous settings has illustrated that an increase in facility-based birth does not necessarily result in fewer maternal deaths or neonatal deaths. High quality of care is essential for improving health outcomes and ensuring that women continue to seek care throughout their current and future pregnancies. 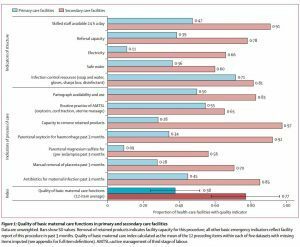 There is huge variation in quality of care and maternal mortality across facilities, particularly in low- and middle-income countries, but research in this area is scarce. 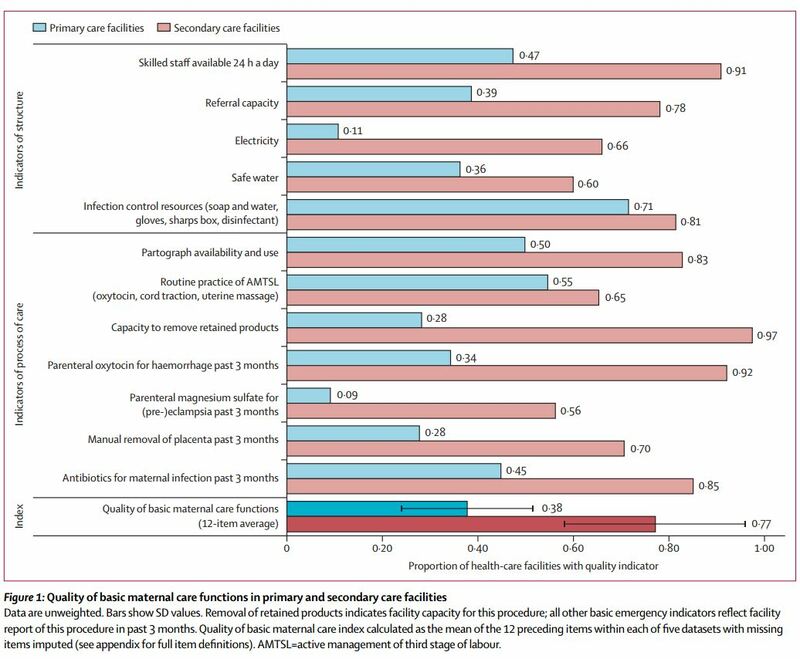 In a recent study published in The Lancet Global Health, Kruk and colleagues used nationally representative health system surveys to examine the quality of maternal health care provided in facilities in Kenya, Namibia, Rwanda, Tanzania and Uganda in relation to volume of deliveries and surgical capacity. Quality of care was evaluated using a set of indicators that measured the facility’s availability of 24-hour skilled staff, referral system, electricity, safe water, equipment for infection control, and ability to administer oxytocin, antibiotics and magnesium sulfate when necessary. The overall quality of care in the sample of 1,715 facilities was low. Nine out of ten facilities providing obstetric services in this region did not have the capacity to perform cesarean sections. The majority of primary facilities—facilities that did not offer cesarean sections—lacked the capacity to respond appropriately to common obstetric emergencies such as pre-eclampsia/eclampsia and postpartum hemorrhage by administering magnesium sulfate and oxytocin, respectively. Only 47% of primary facilities had skilled staff available at all times, 39% had referral capacity, 36% had safe water and a mere 11% had electricity. Although secondary facilities—facilities that offer cesarean sections—generally had better quality of care compared to primary care facilities, only 60% of secondary facilities had adequate safe water supply and 66% operated with electricity. Consistent with findings from high-income countries, higher delivery volume was associated with better quality of care in primary and secondary facilities in these sub-Saharan African countries. Primary facilities with fewer than 500 deliveries per year tended to have the poorest quality of care. The indicators used in this study reflect just a few of the most essential resources and practices necessary for providing high quality maternal health care. Basic infrastructure including electricity and safe water and medicines such as oxytocin and magnesium sulfate are essential elements of high quality care. This study also raises an important question: What steps can be taken to ensure that facilities provide quality care regardless of delivery volume? 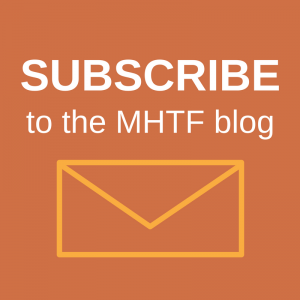 While increasing facility-based delivery may drive improvements in maternal and newborn health outcomes, what happens when a woman arrives at the facility is critical. A focus on understanding and improving the quality of maternal health care is crucial for reducing preventable maternal mortality and morbidity. Read about the paper in the Harvard T.H. Chan School of Public Health news. Hear from Margaret Kruk in the Harvard T.H. Chan School of Public Health podcast: Is any care good care? Explore the new standards for improving quality of maternal and newborn health care from the World Health Organization. Check out the Obstetric Emergency Drills and Training Kit designed to help facilities in low-resource settings prevent and respond to obstetric emergencies. 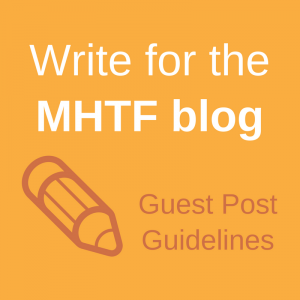 Learn about respectful maternity care, another key component of high quality maternal health care.